INTRODUCTION: Chitosan is a copolymer primarily composing of β (1→4) linked 2- amino-2- deoxy- D- glucopyranose units, and residual 2-acetamido- 2- deoxy- D- glucopyranose units. Although the polymer backbone consists of hydrophilic functional groups and is hydrophobic in nature, chitosan is normally insoluble in water). 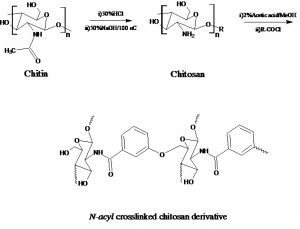 The insolubility of chitosan in aqueous and organic solvents is a result of its crystalline structure, which is reduced by forming an N-acyl cross-linked chitosan derivative which has an antibacterial and antifungal activity 1, 2. MATERIALS: Chitosan (medium molecular mass: 400 KDa; degree of deacetylation: 83–85%) was purchased from Research Laboratories, Acylchlorides was obtained from Sigma. All chemicals were of analytical grade. NMR analysis was performed at IIT Powai. Purification of chitosan: The crude chitosan is dissolved in aqueous 2 % w/v acetic acid. Then the insoluble material is removed giving a clear supernatant solution, which is neutralized with NaOH solution resulting in a purified sample of chitosan as a white precipitate. Further purification may be necessary to prepare medical and pharmaceutical-grade chitosan 3. N- Substitution via N- acylation: The process involves a reaction between chitosan and an acyl chloride. The reaction proceeds through an addition/elimination type mechanism, where amide functionality of the N-amino groups is restored. These reactions are driven toward amide formation because amides are more stable molecules (compared to acyl carbonyls) as explicable in terms of resonance localization of the lone pair electrons on nitrogen into the carbonyl pi system 4 (Figure 1). The procedure involves addition of 3-chlorobenzoylchloride to the solution of chitosan in 1% acetic acid (water: methanol = 10:90). The reaction mixture proceeds on an addition/elimination reaction which yields N-acyl cross-linked derivative of chitosan where the chloro group reacts with hydroxyl of the next chitosan molecule to give aryl-alkyl ether (Figure 2). Isolation of Product: Chitosan and its derivatives are insoluble in acetone. 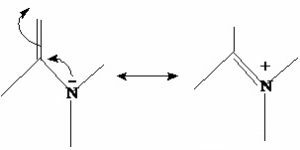 The traces of acyl halides can be dissolved in acetone. Thus the mixture was thus washed with acetone and purified chitosan derivative was obtained. 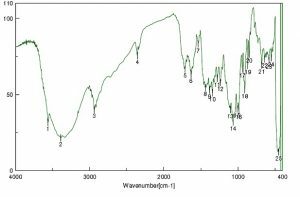 IR Spectra: O-H intermolecular hydrogen bonding 3441.34; C-H stretch 2923.56; may be C-O stretch (carbohydrate overtone) 2360.44; N-C=O, C=C stretch, 1634.38; C-N (20 amine) 1384.64; C-O stretch (alcohols) 1021.12; C-O stretch 1019.19 (Figure 3). NMR Spectra: 8.749: 2o amine; 7.801, 7.661, 7.636, 7.61: Aromatic Protons (benzene); 7.801: -C-O-C-, 5.305: tetrahydropyran methine, 5.292: N-C-O; 4.706: Tetrahydropyran -O-C; 3.618: H-C-O, -O, -C; 2.566: alcohol; 2.339: amine. In-vitro Antibacterial Assessment: The antibacterial activity of the water soluble N-acyl cross-linked chitosan derivatives was studied by employing the Minimum Inhibitory Concentration (MIC) method. A MIC is defined as the lowest concentration of an antimicrobial that will inhibit the visible growth of a microorganism after overnight incubation 4, 5. In-vitro Antifungal Assessment: Briefly, the derivative was dissolved in water. Then, a solution of derivative was added to the sterilized sabrose dextrose agar to give a final concentration of 10, 20, 30, 40, 50, 60 µg/mL. After the mixture was cooled, the mycelium of fungi was transferred to the test plate and incubated at 29 0C for 4 days. When the mycelium of fungi reached the edges of the control plate (without the added samples) the inhibited zone was observed 4, 5. Antibacterial Assessment: The results indicated that the antimicrobial activity of the water soluble cross-linked N-acyl derivatives is much better than that of the parent Chitosan. Antifungal Assessment: The antifungal activities of the water soluble cross-linked N-acyl derivatives of Chitosan are noticeably higher than the commercialised chitosan. Water Solubility: The derivative has shown greater water solubility and faster rate of solubility in acidic and neutral media (Table 1). CONCLUSION: Water soluble cross-linked N-acyl chitosan was prepared from reaction of chitosan with substituted aromatic acyl chloride. Following the derivatization, the antibacterial and antifungal activities were investigated. Using the MIC method, the highest antibacterial and antifungal activities were found for the derivative with N-acyl substitution than commercialized chitosan. ACKNOWLEDGEMENT: We are pleased to thank Appasaheb Birnale College of Pharmacy and Indian Institute of Technology, Powai for providing desirable facility for this research work. Caiqin Q., Huirong L., Qi X., Yi L., Juncheng Z., Yumin D., Water-solubility of chitosan and its antimicrobial activity, European Polymer Journal 39, 2003: 1629–1634. 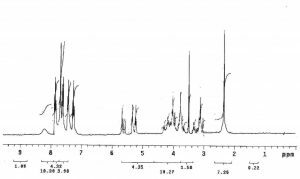 Karine M., Leandra B., Ronaldo P., Bronislaw P., Synthesis and Physicochemical Characterization of Chemically Modified Chitosan by Succinic Anhydride, Brazilian archives of biology and technology, an international journal 49, 2006; (4) : 665-668. Yajun X., Xiaofei L., Qiang C., Synthesis and characterization of water-soluble chitosan derivate and its antibacterial and antifungal activity, Carbohydrate Polymers 69, 2007: 142–147. Thatte MR, Synthesis and antibacterial and antifungal assessment of water-soluble hydrophobic chitosan derivatives bearing quaternary ammonium functionality, A Dissertation Submitted to the Graduate Faculty of the Louisiana State University.